Elyn lived in China with her family for 30 years, soaking up the history and culture, having fun, and making many friends. What makes the Chinese garden Chinese? 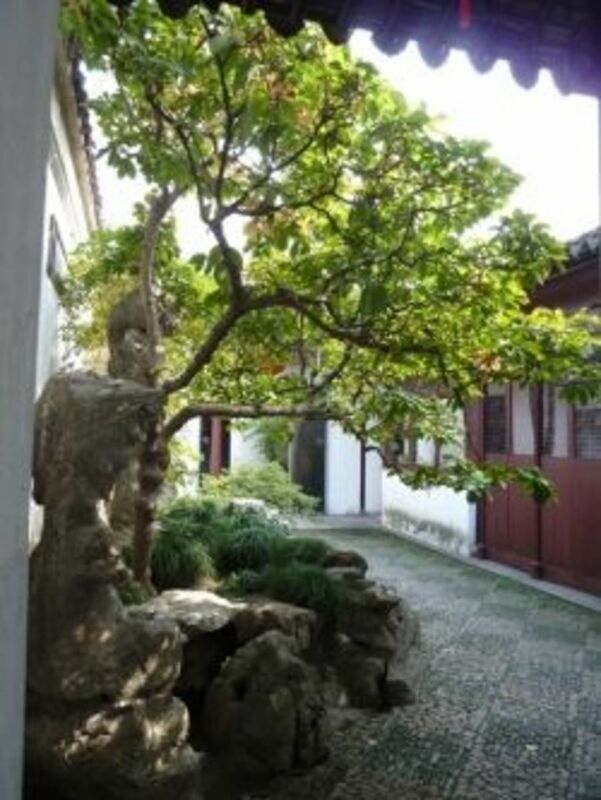 Photos of most of the elements of a Chinese Garden can be found here on this page. Most Chinese classical gardens have these elements, and they are part of what makes the Chinese Garden Chinese. 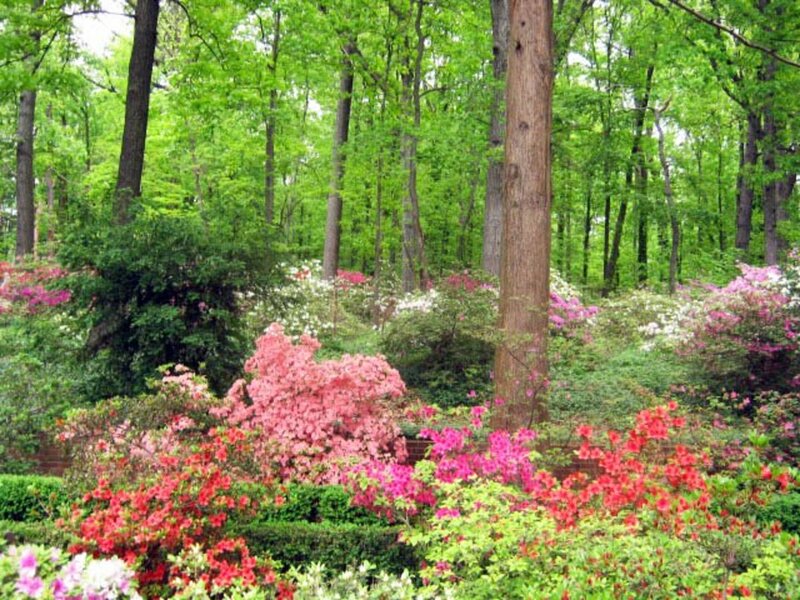 Perhaps you will get to China some day, and can visit these gardens in person. 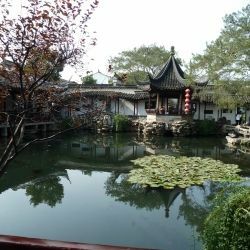 In the meantime, I hope you enjoy these Chinese garden photos I have taken through the years and learn a little about the philosophy and structure of a Chinese Garden. The photos taken on this page were taken over the last 30 years by Elyn MacInnis. A Chinese garden is full of symbolism, and is meant to be a representation of the universe, and at the same time a miniature presentation of vast natural landscapes, there in all their glory, yet so small they can fit into a tiny pocket of land as a part of an extended Chinese family's sprawling house complex. It is the setting for huge family gatherings, especially during holidays, the place where people went for contemplation, where scholars, poets, and government officials met to discuss important topics, and a place for peace and relaxation. It is hard to imagine until you have been in a few. 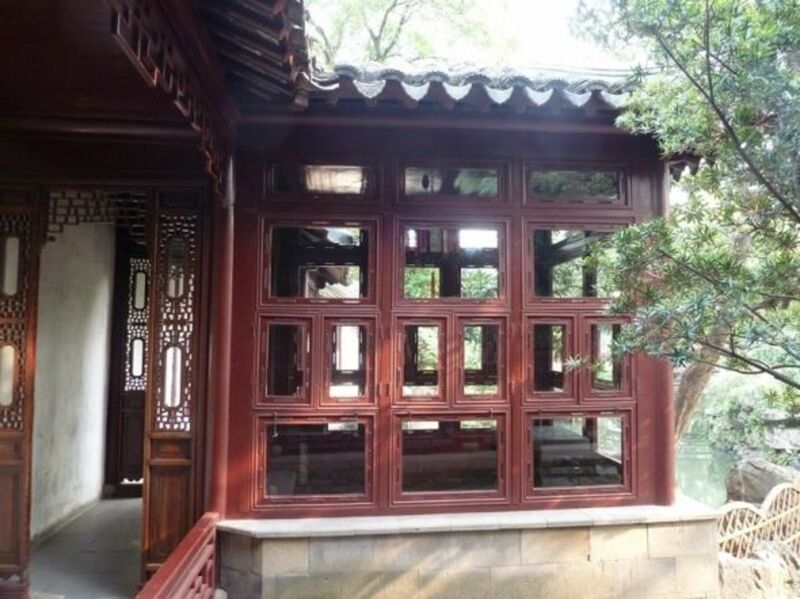 If you don't observe carefully, you might think that all Chinese gardens are similar, with the same ideas - central pond, rock piles, corridors, latticed windows, old trees, and many buildings. But there is a lot of expression within the "rules" themselves, each garden has its own delightful aspects that people from all over the world appreciate to this day. They say it takes 300 years to cultivate a garden. Think about that. 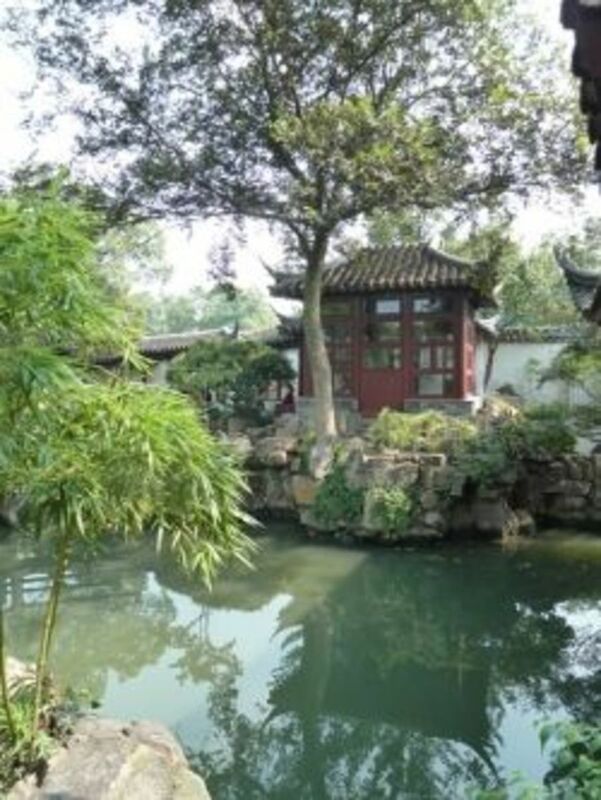 A body of water - a lake or pond - is critical to a Chinese Garden. It is both practical as well as an important philosophical statement. 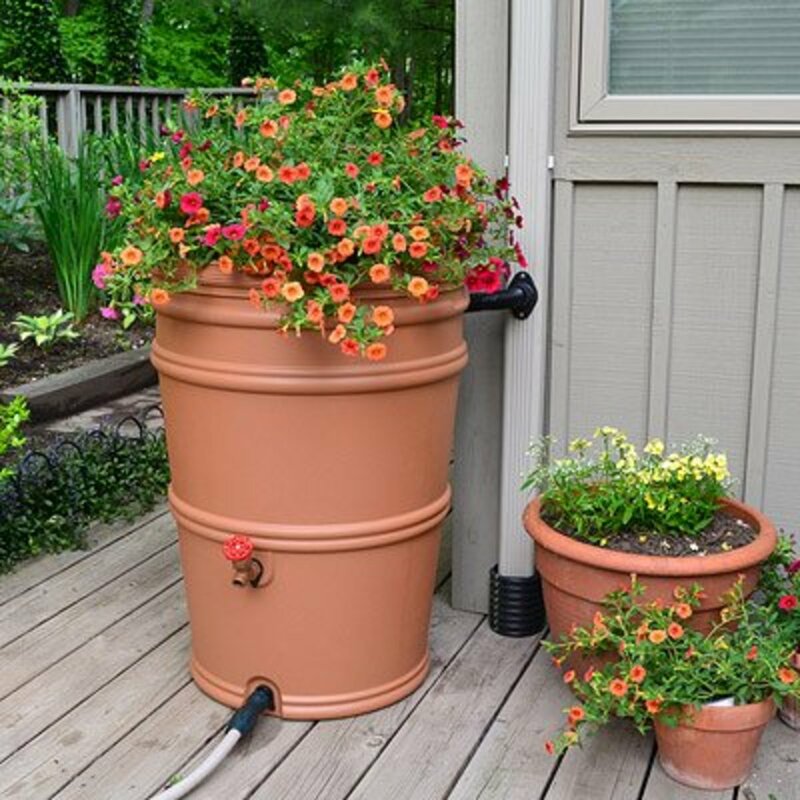 The practical reasons are that it provides humidity and a cooling oasis in the center, as well as water for the plants and fish. It is also there for philosophical reasons. Water is Yin in Taoist theory, the soft, yielding. 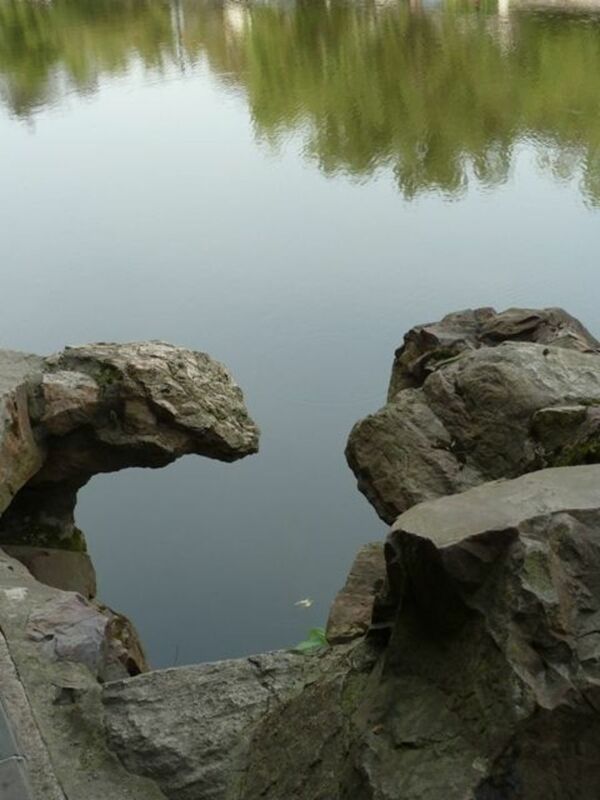 The Lake Tai stones at the edge of the pond are Yang, the solid, unyielding. Together there is The Whole, the Yin Yang that describes all life, that balances your Qi energy, and gives vitality to all who visit the garden. 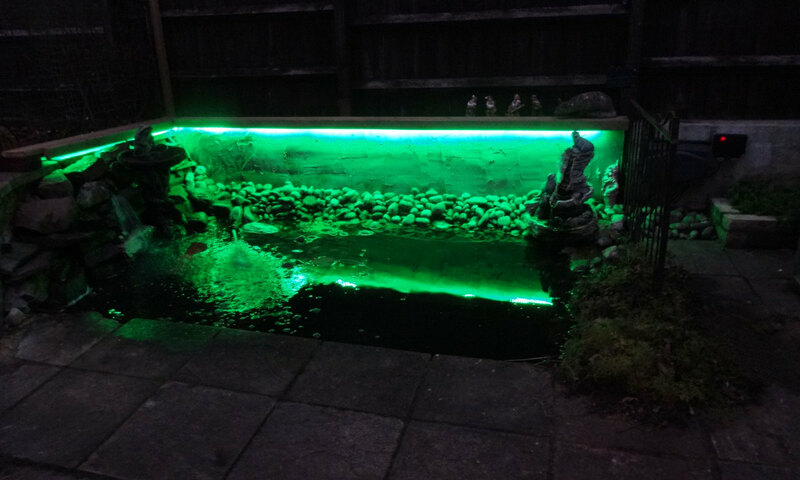 The water also provides beautiful reflections, can be a mirror for beautiful ladies anxious to have a glimpse at what their face looks like, can be used in case of fire, and can also be used to water the trees and plants throughout the garden. 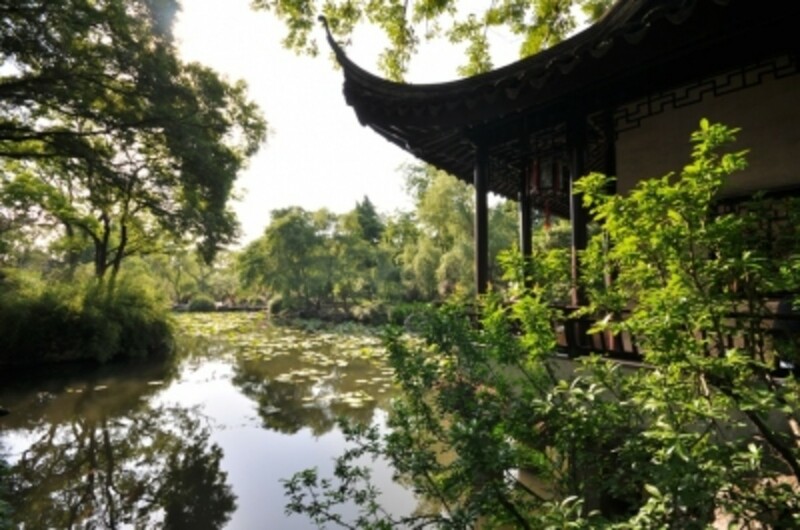 In the earliest days of creating gardens, the name for this process was "cultivating a pond," instead of "creating a garden," and that also gives us some insight into how important a pond is to a Chinese garden. Lake Tai stones are full of holes. Everyone likes strange and unusual things. 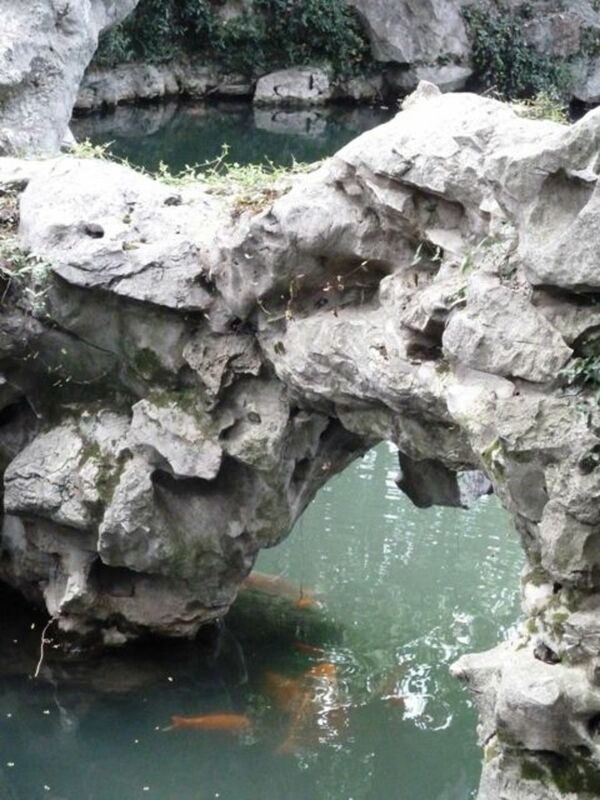 Stones from Lake Tai are very unusual, and are prized in China for their amazing holes, nooks and crannies. The holes occur when the limestone at the base of Lake Tai is eroded in certain spots, creating holes. It takes thousands of years, and that is another interesting piece about these rocks. 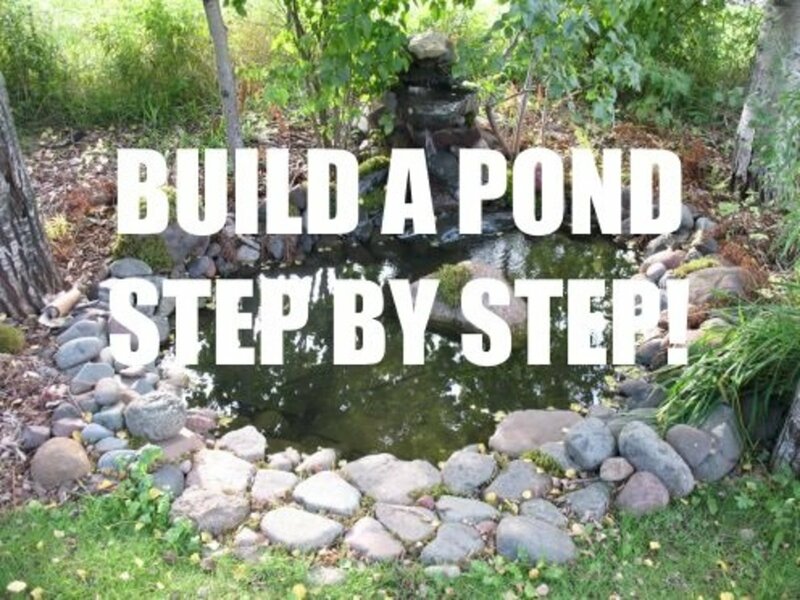 Stone is hard, and makes a good accompaniment for the soft water of the pond in the center of the garden. In fact, it is the soft flowing water of Lake Tai that makes the holes in the limestone under water, and creates these amazing stones. They are often piled up into stone mountains, many times layered, so that you get the illusion that you are in the mountains, looking at the craggy rocks layered in the distance. 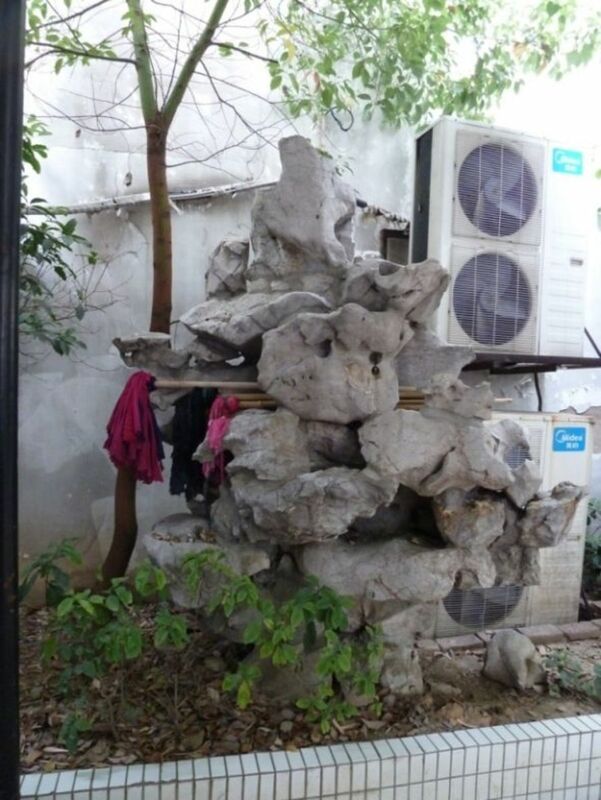 Chinese people love strange stones. and they get great delight in imagining what the stones could portray. A chicken, a layer of clouds or mountains, a tortoise, two birds talking? The rocks have a kind of freedom that is delightful. Lake Tai Rocks layered - Doesn't this look like a pagoda in the distance mountains? It really isn't far at all. Carp are beloved. 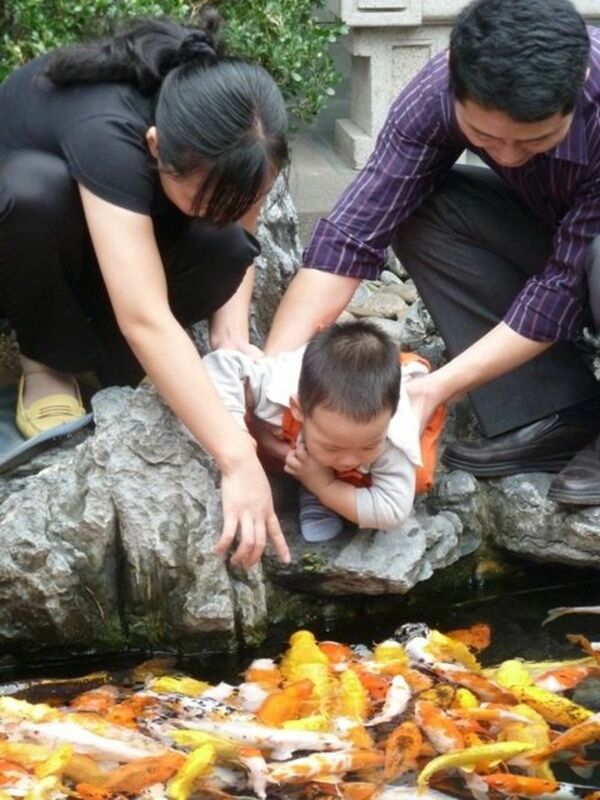 Who doesn't enjoy feeding the fish? A good Chinese garden has golden carp in the central pond. Carp can be food for the family, and in some gardens there are special pavilions with the exact purpose of watching the fish. The view of the view of the view. 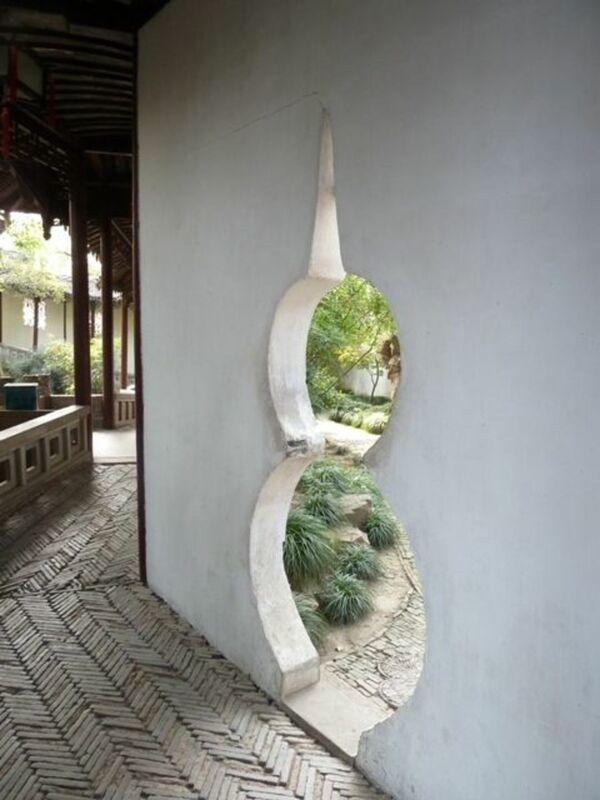 This is a common feature of a Chinese garden. 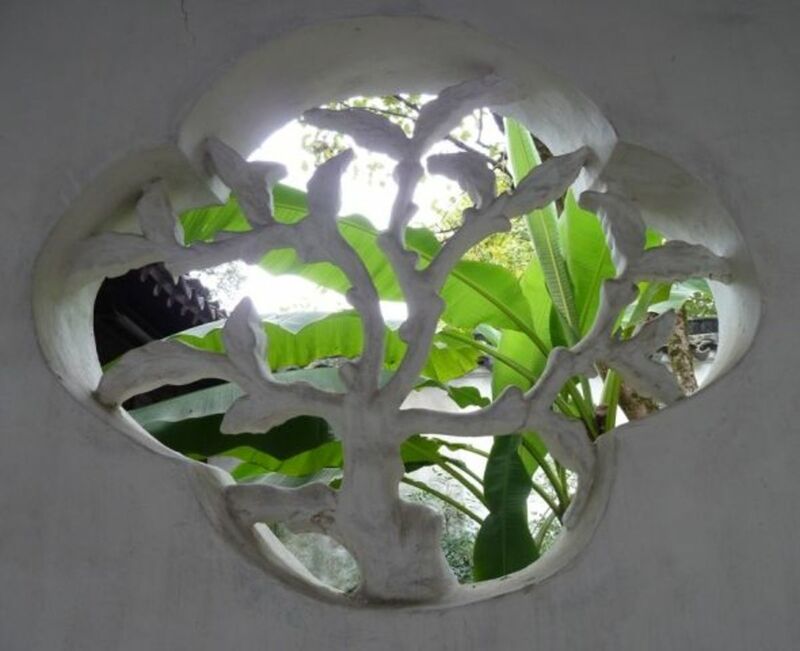 If you look through the frame of a door, you may find a window just inside the door, which looks through into a garden, giving you a vista of layers upon layers of scenery. It is a reminder of how complex and layered our lives are, and also how complex our universe is. At any rate, make sure you think of layers and appreciate them. Whoever thought to make a door in the shape of a gourd? I can imagine a moon - but a gourd? It isn't as strange as you might think. The gourd is a symbol for long life. Surely this door was created when someone reached a ripe old age and this symbolic shape was created instead of a regular shape. Even if no one made it to 80, gourds could be seen as a wish that someone would live a long life, a blessing every time you walk through the door. Nice idea! Why is the gourd a symbol of long life? Because the God of Long Life, who has a head shaped like a peach, carries a gourd on a stick over his shoulder that has the "elixir of long life" in it. This comes from one of China's many tales from thousands of years ago. See his head shaped like a peach? That's how you know. 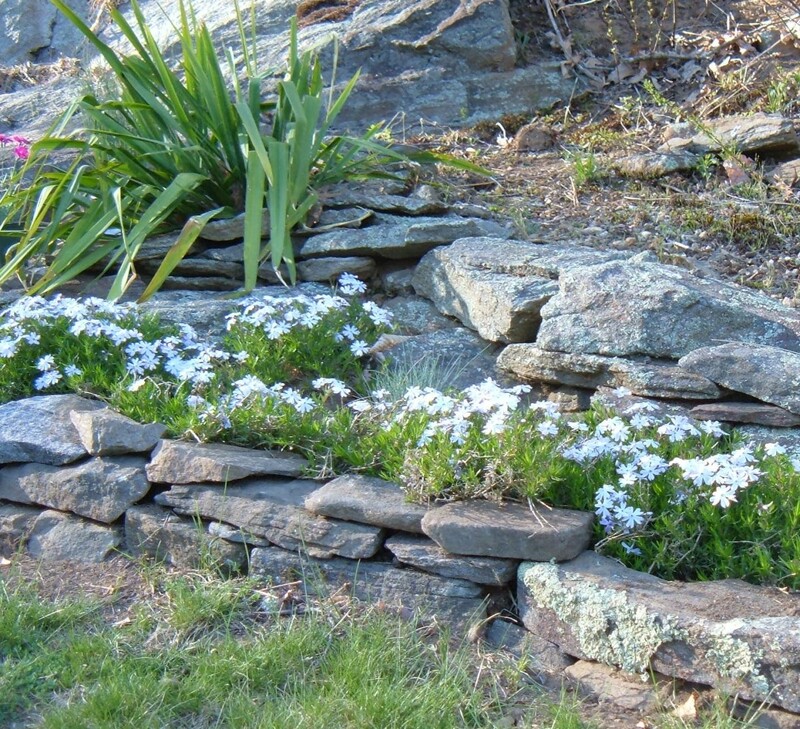 A garden is an exercise in "cultivating temperament." It takes time to find the right parts. If you have an inscription hanging over a door, you need the right person to do the calligraphy, hopefully an Emperor, and you have to wait until the right moment and the right connections to ask for it. You also have to wait for the plants to grow. A good garden is not something that happens overnight, but matures and deepens its beauty as years go by. When you make a garden you are not just doing it for now, but are anticipating the future, and imagining the generations to come. In a Chinese garden you are also expected to build on what was there before you. Sometimes new ideas arise, and if it is well received by people, you will suddenly find it in many local gardens. This is not so much copying as it is improving. What happened in Chinese Gardens? - All sorts of things! Moon Festival celebrations for one! Many Chinese celebrations of were held out in the garden. Extended family, friends, and important people all might have been invited to be part of celebrations. There would be tables full of food for the guests and offerings in honor of the moon. Everyone would sing songs, write poems, drink wine, eat mooncakes filled with sweet lotus seed paste, and have a good time being with each other. Gardens were also places where lovers could meet. In the 1980s and 90s, gardens like the "Couples Garden" were still a meeting spot for lovers. If you poked your head around any corner, there you could find couples enjoying themselves, often kissing. Chinese homes are very crowded, often with grandparents sharing the space. With no room to your own, what would you do if you had a boyfriend or girlfriend? Several hundred years ago it was the same - lovers often found a private spot where they could meet in the garden for a quick talk, and maybe a smooch. 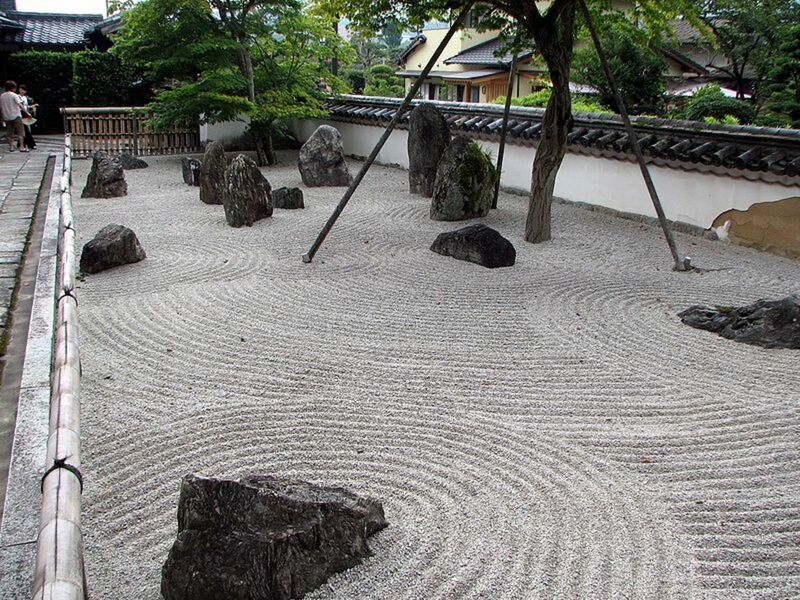 Gardens were also a place where people eased their hearts, and spent time in contemplation. People still do that in gardens very naturally. Gardens were to enjoy. They were planned so that no matter where you looked, there was a new view and some new delight for your eyes. 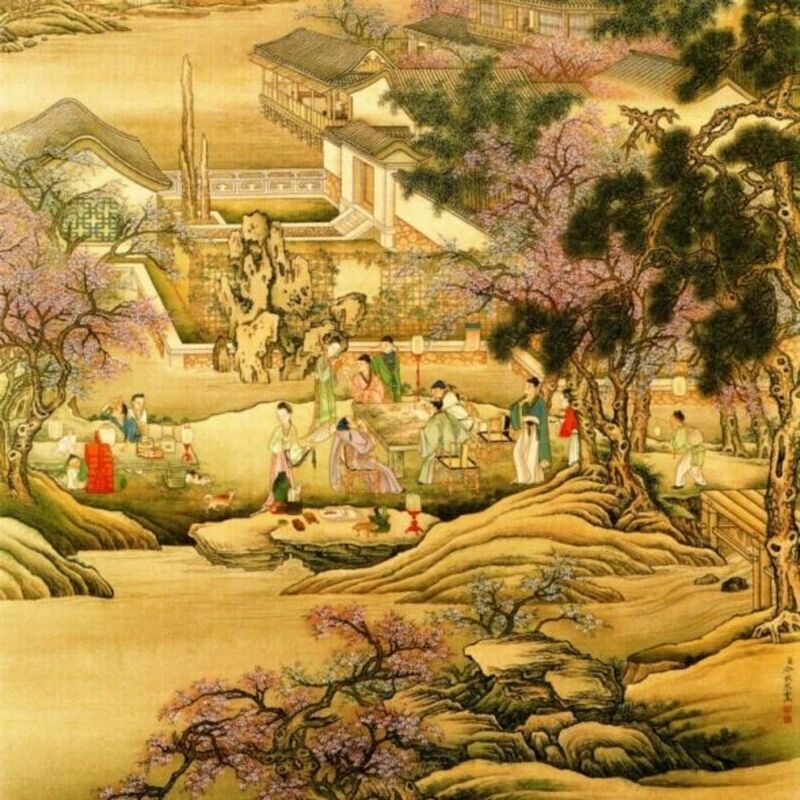 The painting above is a segment of the painting "Evening Banquet at the Peach and Pear Blossom Garden". Ink and color on silk by Leng Mei from the National Palace Museum, Taipei, and is in the public domain. Just as gardens were a place for contemplation, they were also a place where poets and writers, officials and philosophers gathered and discussed their latest theories and philosophy. They also discussed deep philosophy and complex matters of religion. 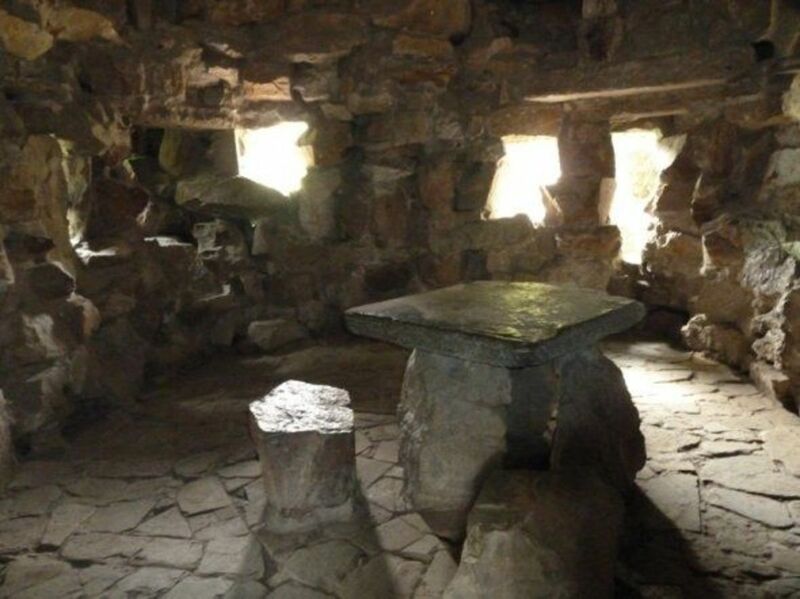 In order not to be bothered, they often created hidden rooms where they could discuss their ideas in private. 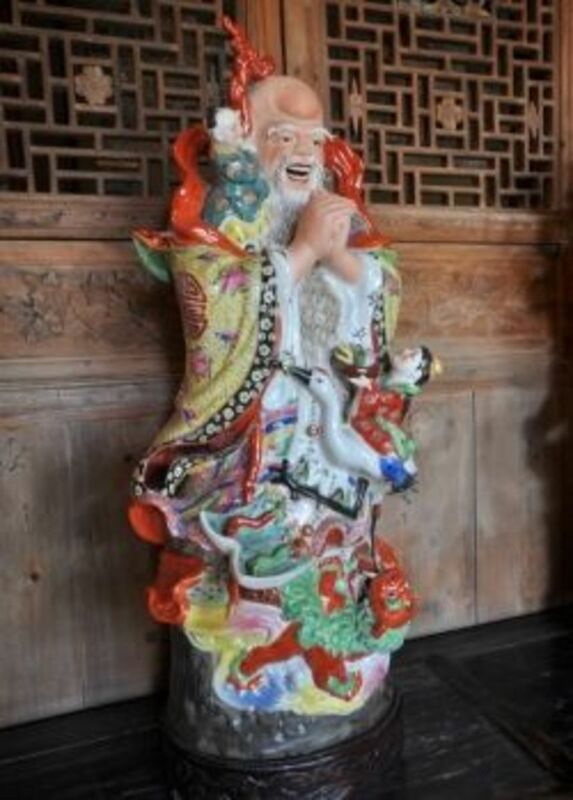 The picture below is of a secret room in the Surging Waves Pavilion in Suzhou. What kind of architecture did they plan around the garden? Corridors for one! In the Suzhou area, it rained a lot. If household help needed to carry food to the master and mistress of the garden, it was helpful to walk along corridors instead of having to walk through the garden in the rain. 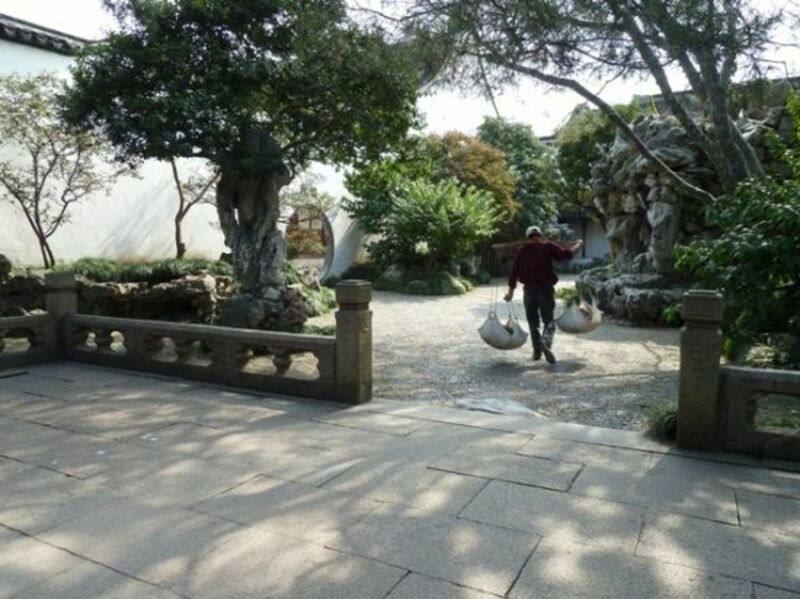 Corridors are critical to garden architecture in Suzhou, south of the Yangzi River. Why have pavilions in a Chinese Garden? - You'll never guess! They are for looking at the scenery, writing poetry, drinking tea, listening to the sound of the waterfall, painting, and enjoying the rain without getting wet. AND - my favorite, gazing at the moon, especially the full moon in September during the Mid Autumn Moon Festival. Each year my husband and I find a place where we can sit out at night and gaze at the moon when it is full. Sometimes people say the moon looks fuller on the night after the official full moon. This little room at the edge of the garden was built here specifically for gazing at the autumn moon, with a clear view to the moon's position during the Moon Festival. The moon can be shady, clear, full or dim. This has been so since the beginning of time. May we all be blessed with longevity. 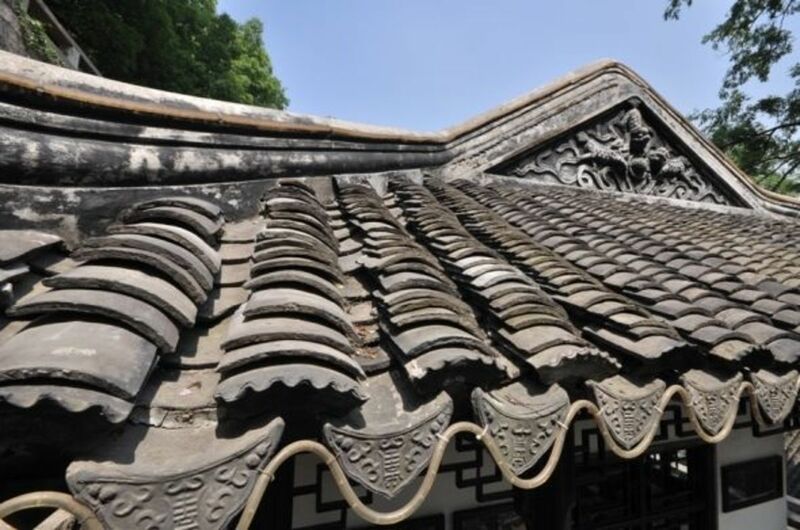 Roofs in most houses in China (not apartment buildings) are made of roof tiles. This picture will help you get a closer look at them. Looking in the back corners of a classical Chinese Garden. Things have changed a little in the 2000s. Originally published around 1631, this book is a classic. Usually books that old are not extremely useful to us now since the writing is so dense compared to our modern languages. But the incredibly talented translator, Allison Hardie, and the project leader, Maggie Keswick, have added notes, forwards, and introductions that have made the text delightfully understandable. 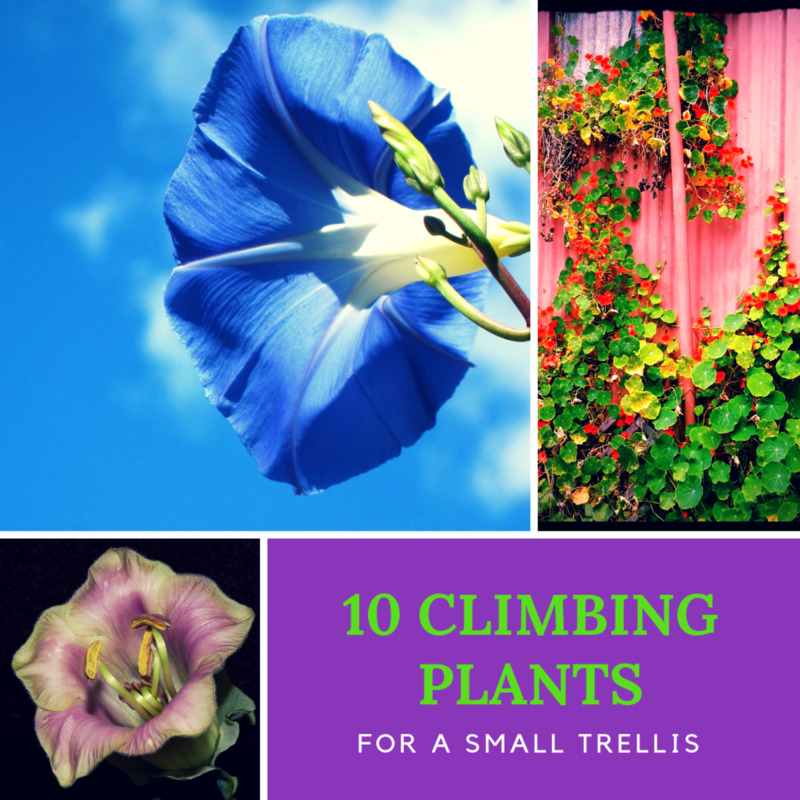 If you love gardens, you will love this book. Wonderful gardens. 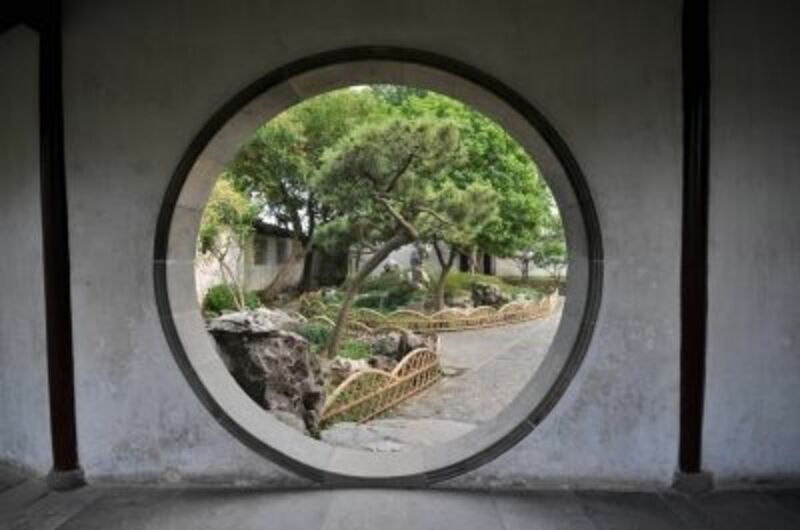 The "Moon Gate" reminds me of the garden we went to in Suzhou. These gardens are beautiful, and I loved all the details that you included. I have a good friend who is Chinese (from Hong Kong) who is married to a Japanese-American landscape architect, and their garden is a combination of both Chinese and Japanese and it's so peaceful and relaxing. How beautiful these gardens are now that I understand its meaning. I visited my son in Beijing when he studied in China for a year. We visited some places with lovely gardens like this. Thanks for the detailed look at this age old practice and the meanings behind the features. 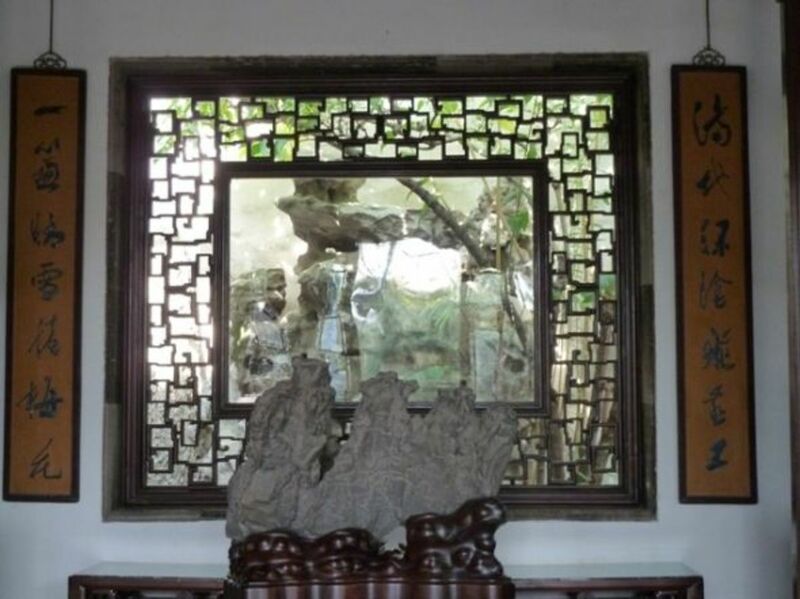 I enjoyed looking at the photos you took of Chinese gardens as well as your explanation of the symbolism and function of the water, stones, gates and rooms. Thanks! Such a zen experience to visit this lens again, I love it. I enjoyed your lens. I traveled to China in 2011 and plan to take another trip there in 2013. I will pay close attention to the gardens with the information you have presented here in mind. Thanks. Informative lens and i like the photography. Chinese gardens are beautiful. The architecture and plant choice is slightly different to Japanese gardens, which seem more controlled and open. Both are wonderful! 300 years... to cultivate a garden. I find it very meaningful to think of this. Really appreciated this glimpse into Chinese culture. I want one of those secret garden rooms and moon pavilions. Oh, and of course, some koi in a pond. @Diana Wenzel: I agree. I really love the secret rooms. They are very cool. Water in a garden is so soothing. Beautiful--thank you so much for this lens! Really beautiful with lots of great ideas and suggestions! Lovely lens. 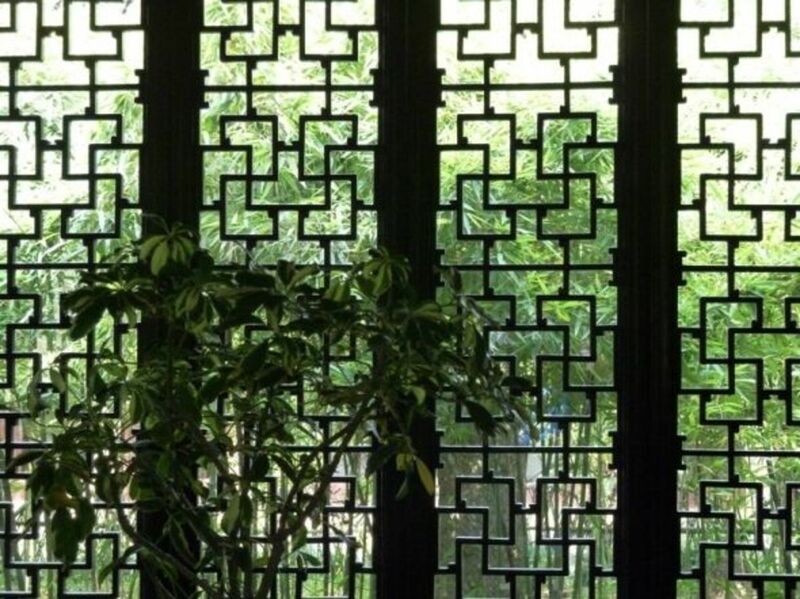 I find Chinese gardens very calming, even if it's just a matter of looking at pictures of them. I very much enjoyed this lens. Beautiful and interesting. I hope it helps to inspire me in my gardening through the years to come. Great lens. Beautiful pics. Loved it. I also am fascinated with China and Chinese stuff! So beautiful! I would love a chinese garden! Blessed! So, so amazing, beautiful photos, and a great lens! Very beautiful. I would love one of these. Blessed! Beautiful pictures, and I learned so much... thanks for a nice read! If there is a heaven, it's here on earth. These gardens represent a part of the respect the best of us feel for the world and our place within it. Someday, perhaps our lives will be as timeless as these beautiful places. Love the pictures, especially of the different ways that light enters the gardens! What a lovely idea for a lens.....and a garden. This is an absolutely beautiful lens and so informative. As I move into my new home soon and have a yard that has overgrown and has to be tended, I am getting inspiration from this lens. Thanks. Blessed. Beautiful pictures in your lens. Absolutely beautiful! Thanks so much for sharing! Blessed by a SquidAngel! 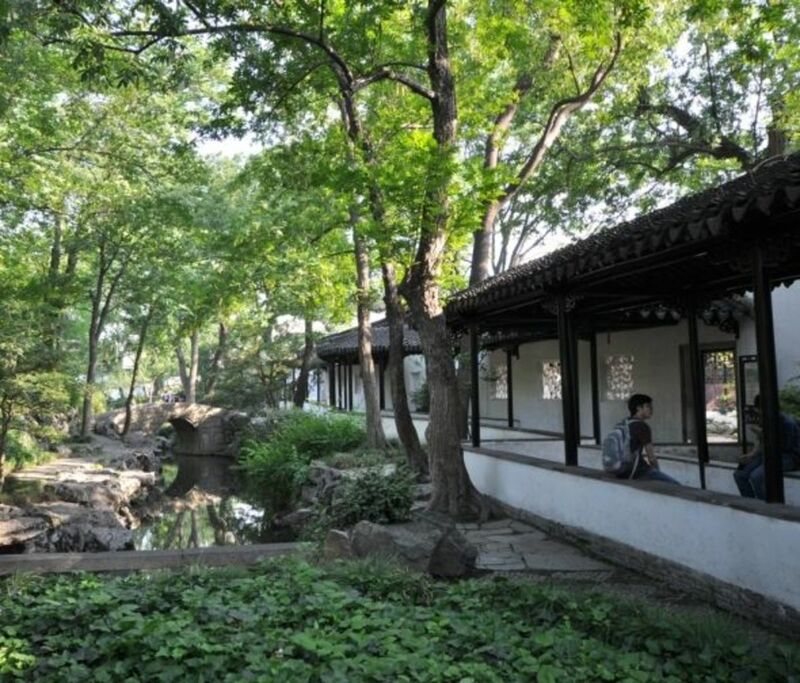 Very good writing on Chinese garden, as a Chinese I don't know as much as you have understood ! Yes I like and enjoy reading it, thanks. These gardens are fantastic looking. There is just something about them that draws me to the unique looks. We visited one in Canada, it was very beautiful!! This is a beautiful and well written lens. Very inviting. This was a great lens, the pictures were beautiful and it was all very interesting! So beautiful and well-presented. I'd love a moon gate. Interesting and well done lens. beautiful pictures and I really like the koi. This is an amazing lens. I've always enjoyed these gardens but now I know a bit about the "why". Blessed! Great! I have chinese garden at my backyard. This lens looks great and you show us some great pictures, thank you for that. Blessed. Beautiful lens. Thank you for sharing! Love the lens. The Chinese garden is very symbolic and beautiful. yes! I like Chinese Gardner, I find all of them relaxing, full of vegetation, and healthy. Thanks for a great lens. Blessings! Beautiful ah! 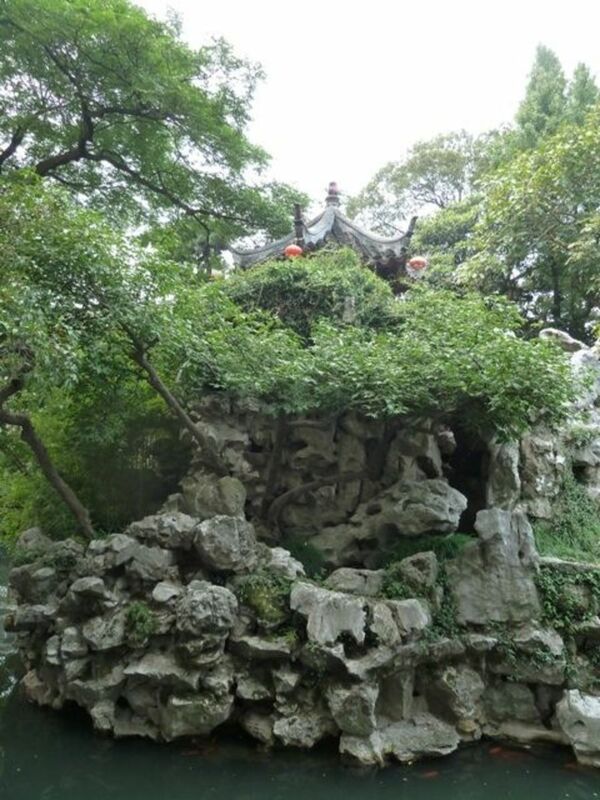 This is the legendary gardens in Suzhou?It is so beautiful!Thank you to share. Like your lens very much! thank you for sharing! What a beautiful lens and garden. Congratulations on the purple star. Blessed. Thank you for creating an informative lens. I love the photo of the carp. I enjoyed learning about this...thanks! Lovely lens! I visited a Chinese Garden in San Francisco but it wasn't nearly this elaborate. OMG! Oh, my goodness, this is such a lovely lens! I felt at peace just viewing the photos. Thank you! Awesome lens. I love the Chinese culture. Their artwork and architecture is some of the most beautiful in the world. Someday I want to go there. I also love the way they worship their elders unlike in the US. Their elders hold a respectful place in their society. I did not know too much about Chinese gardens until now. Thanks for sharing. I can see why this lens won a purple star, it's absolutely beautiful. How lovely! I would love to visit one. Beautiful lens. I used to visit the Chinese Gardens in Vancouver and it was so peaceful there. Very educational and beautiful, thanks. Great lens. Chinese gardens are lovely. You've done a great job with your words and photographs here. 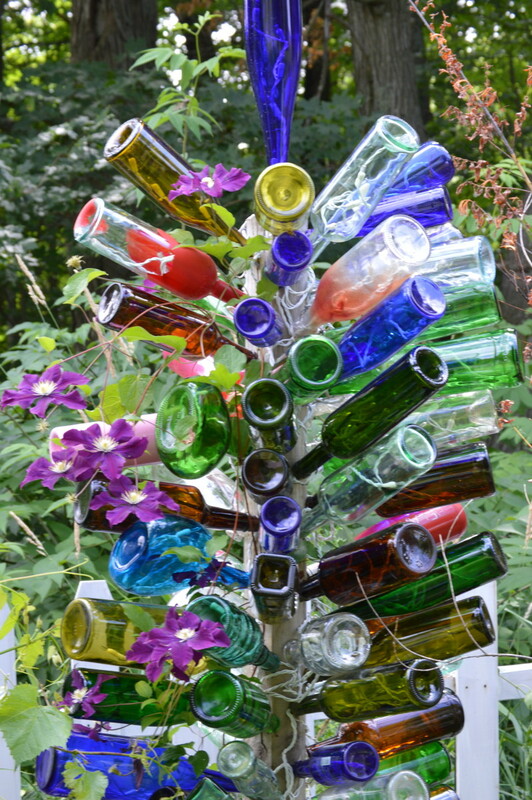 This was beautiful and inspiring for a garden yet to be at my home - thanks for sharing. I have been to Chinese gardens in several cities around the world (SF, Ireland, NY), but don't think I ever saw such a complete explanation to help interpret their key components. Thank you for sharing! Blessed! @anonymous: I love moon cakes too. But not all of them! I like the ones from Guangzhou - lotus seed. Yum! Beautiful gardens and so interesting to learn about the traditions and philosophy behind them.